My prior experience with commercially-made kayak sails has been mostly with the Pacific Action sail and the Spirit Sail. 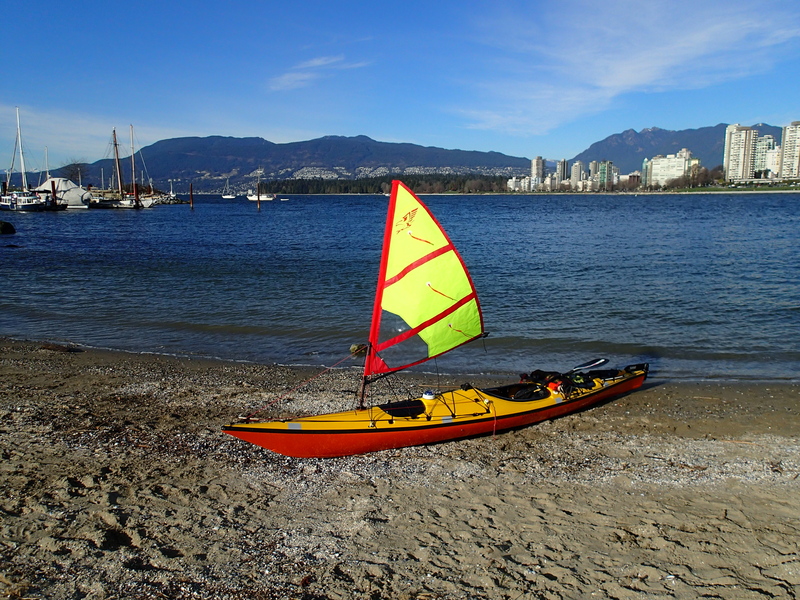 I used them both for more than a decade on my previous kayak, and loved the versatility of being able to raise either or both so I could sail in anything from strong winds to gentle breezes. They were especially fast on broad reaches. But they are functionally square rigs, optimized for downwind sailing. 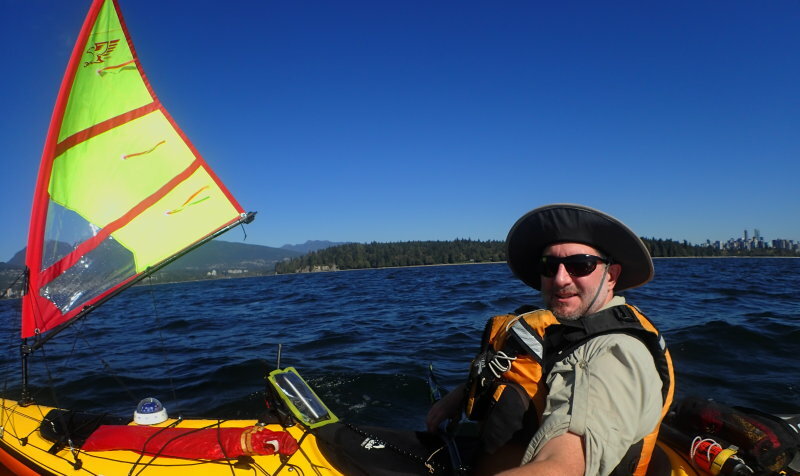 On my new kayak, I wanted better across-the-wind performance and some upwind ability. So I upgraded to a Falcon Sail. A note on handling sudden gusts in this zone: a sailor’s conditioned response to getting heeled over is to let out the mainsheet and allow the sail to depower. With the Falcon Sail, when sailing downwind between port and starboard broad reaches, the leeward back stay will stop the boom from swinging completely parallel to the wind. So be ready to also crank the rudder over and luff up into the wind if needed. On all other points of sail, the Falcon outperforms anything else I’ve bought or made. It lets me make good off-wind angles that I previously needed a leeboard to achieve. To go much to windward with the Falcon, you need to paddle as well as sail. This power sailing is no hardship; paddling increases the apparent wind, making it faster and more fun than paddling alone. Leaning my body upwind to trim the boat while watching the bow cut diagonally across oncoming waves is glorious. So is using about a half to a third of the effort I’d otherwise expend to make good the same course; it’s like having a second paddler sharing the work. That’s especially welcome at the end of a long touring day, when your boat and arms have gotten heavier, and your destination further away. Falcon Sail’s FAQs mention being able to sail 300 degrees, or within 30 degrees of the wind, “when all conditions are optimized.” So far, my own real-world results have been roughly to within 60 or 65 degrees of the wind made good. But that’s affected by two factors: the rounder chines on my new kayak, and the fact that I’m still mastering the subtle trimming needed to get the most out of an upwind sail. Even at my current level, I’m able to sail effectively across an arc of about 240 degrees, a far wider zone than with my previous set-ups. That means that on any given day the odds are hugely increased that I’ll be able to sail or power sail at least part of the time. When I first started adding sails to my boats a decade and a half ago, it opened up whole new dimensions in sea kayaking. 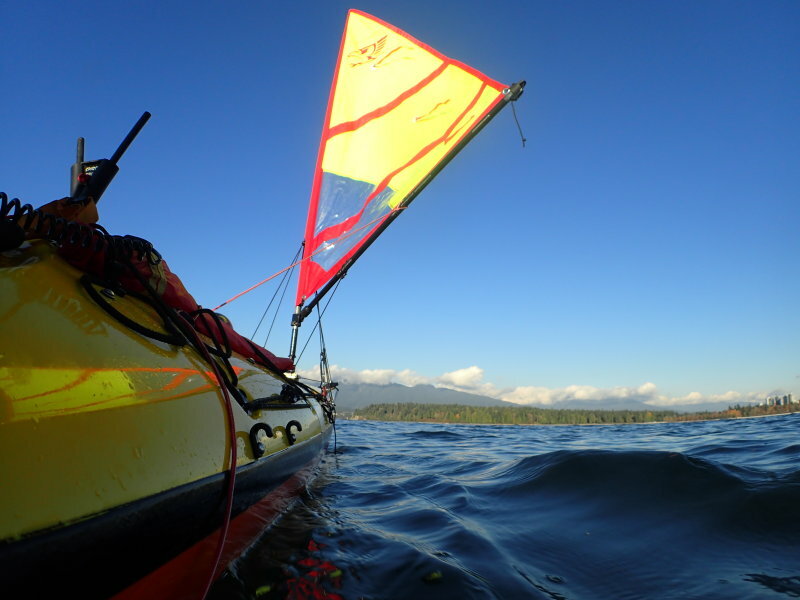 Adding the Falcon Sail to my boat has opened up whole new dimensions in sea kayak sailing. I have no connection to Falcon Sails beyond being a very happy customer. The tell-tales on the sail are not factory supplied; they’re after-market accessories I added. This entry was posted in Falcon kayak sails, kayak sail, Kayak Sailing, sea kayak, sea kayak sailing, Sea Kayaking and tagged Falcon kayak sail, Falcon Sail, kayak sail, Kayak Sailing, kayak touring, Sea Kayaking by Philip Torrens. Bookmark the permalink. Hi, what a wonderful blog. I’m sitting here in Winnipeg glued to your videos and salivating as I’m thinking about trying the Falcon sail on my kayak. Will the sail work on a 17 foot Cape Horn Wilderness Systems kayak on Lake Winnipeg? Thank-you ever so much for taking the time, not only to provide such a thorough review but also for the excellent videos. I know it’s very time consuming to do what you did but what a wonderful benefit for all of us. Thanks for the kind words; always nice to know I’m not blogging into the void. Can’t think why that sail/combo wouldn’t work. If you contact Patrick at Falcon I’m sure he’ll have helpful advice about which size sail to get and how to install it. Falcon Sails mentioned specificially that theirs sails do not work on Lake Winnipeg. All other lakes are fine, but not Lake Winnipeg due to the viscocity of the water. Falcon Sails also mentioned it will soon come out with a special edition for Lake Winnipeg. Just ask for it. And have a laugh. I think I detect a note of irony in your response but just to be safe, I plan to sail my kayak on the Red River (which flows into Lake Winnipeg). I’ll let you know what the Falcon sail can do for my kayay on the Red next summer. Happy to read that your Falcon sail is doing fine on upwind courses. I’ve been using a Flat Earth sail for a couple of years at sea along the Dutch coast and on lakes. My experience with upwind courses are about the same. Not paddling along means a very slow pace and paddling a bit gets me going till about 40 degrees. The funny thing is that my sail sometimes doesn’t push any extra in strong windgusts upwind (sheeted in all the way). Not forward and even no heeling force while my paddle is almost blowing out of my hands. Sometims nothing happens. But in calm winds it sometimes really catches on while paddlesailing close to 35 degrees. Haven’t figured out why. It’s always a surprise to see what happens when close hauling. Easing the sheet out till the luff starts wrinkling of pulling the sheet further in doesn’t make any difference. I think it’s the wind (being blocked by the waves yes or no, steady winddirection, movement of the kayak etc..) that defines the result. Anyway, it keeps me busy and I like it. I think Falcon and Flat Earth are both good kayaksails in their own right. Happy paddlesailing!